In-stock Football Uniforms brought to you by Shop4teams, your #1 online source for all your team football uniform needs. Great looking in stock football jerseys at discounted prices for the team and individual from a variety of manufacturers including Teamwork, Holloway, Badger, and Augusta. Choose from styles in adult and youth sizes. With our guaranteed lowest prices and fantastic selection, Shop4teams is the best online dealer for in stock football uniforms for your team. Shop4teams has helped thousands of high school and college football teams take the field in style, with new custom made football jerseys and practice gear. Our products assert top of the line quality and creativity. We provide champion football teams with the top notch game uniforms and practice gear they need to achieve peak levels of performance – and to look great while doing it. When players are proud of the jerseys they wear, it translates into enhanced performances on the field. We take custom made football uniforms so seriously because we want the players who wear our products to look great and feel unstoppable each and every time they take the field. We don’t just make fantastic custom screen printed t-shirts, we make fierce custom football jerseys too. Our team youth football jerseys are worn by teams from all over the country, and we want to partner with you in designing your team’s next line of custom football team uniforms. 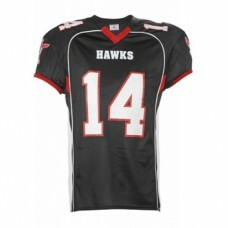 Get ready for kick off with a huge selection of practice and game football jerseys in both home and away colors. Blank jerseys can ship SAME DAY or add your team logo, numbers, team name, player name - all can be turned around in just 10 Business days. Rush shipping options are available! Contact us today to join the thousands of satisfied coaches, players and teams who depend on us for top of the line custom football uniforms. Size chart Two layers of 100% polyester tricot mesh * Fully reversible for wearing on either side.. Size chart 100% polyester tricot mesh* 1x1 rib-knit modified V-neck collar* Front and back yoke i..
click here for Size Chart 83% Polyester/ 17% spandex - Moisture management Stretch body fit - Se..
click here for Size Chart 83% Polyester/ 17% Spandex - Moisture management. Stretch body fit - Se..
LIMITED QUANTITIES ! Please call for availability !Size chart 100% polyester diamond mesh * 1x..
LIMITED QUANTITIES ! Please call for availability !Size chart 14 ounce 100% polyester doubl.. Size chart 600-denier polyester with durable PVC backing with shiny inserts inserts inserts*Large..